We find ourselves once again asking what secrets lie in the house that Jobs built, only this time, we’re focusing on the garage. Speculation has been rampant that Apple is prepping to dip into the automotive world in some fashion, and now some newly acquired documentation is giving these rumors some substance. According to documents acquired by The Guardian, the technology company has scouted GoMentum Station as a possible test site for … something. The reason why this feeds into Apple Car rumors is due to the fact that the 2,100-acre decommissioned naval base has a track record of being booked by auto manufacturers testing our their upcoming wares. The document purports to have an exchange from Apple engineer Frank Fearon inquiring about scheduling the base for their needs. What makes this area so appealing for clandestine vehicle testing is not only the fact that it’s privately owned and guarded by the military, but it contains 20 miles of roads that simulate both highway settings and local roads. 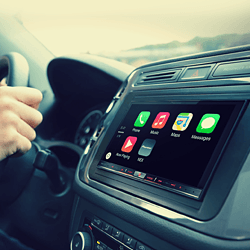 The facility has been previously been scheduled by car makers such as Mercedes-Benz and Honda both testing out their own versions of autonomous vehicles, which Apple is also rumored to be developing. Randy Iwasaki, executive director of the Contra Costa Transportation Authority, owner of GoMentum Station stated simply that Apple has been interested in using the site, but a nondisclosure agreement prevents him from stating anything further. Does it confirm that Apple is building an iCar of some sort? Not necessarily. It doesn’t rule out the possibility, but the venue could just as easily be used to test out anything car-related, perhaps even further development of Car Play. We’re sure to hear and see what they have in store well before we plan to queue up/camp outside our local store.